Thanks to John Hagan for this ride report, and also for the excellent photos and map. When we looked to the west before starting the dark thunder clouds were threatening. However, the wind dropped to almost zero and the sun came out for a near perfect morning’s ride. The riders were: Rolf, Mike T, Mike C, David I, and John from GTC and Helen, Coralie, Rick, and Kelly from Cycling Geelong with Mike C being a member of both clubs. 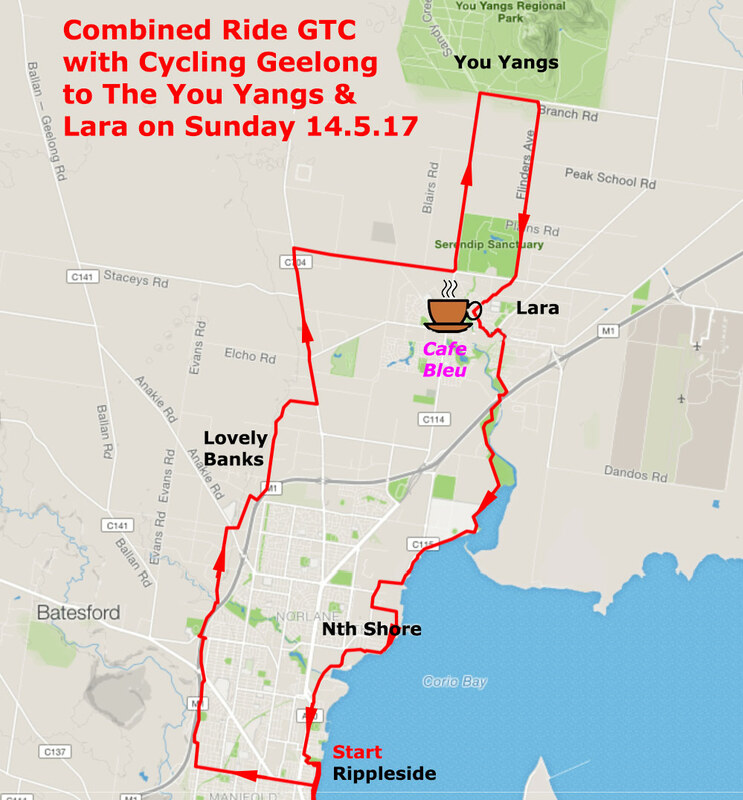 Helen Lyth took us out along Bluestone Bridge Rd, through Lovely Banks and out to the You Yangs on Forest Rd and we returned to Lara on Flinders Avenue. We struggled to find space in any of the cafes in Lara as it was Mothers’ Day but squeezed into Cafe Blu with some outside and others inside. The return trip was via Hovell’s Trail with a stop at Limeburners Lagoon to admire the reflections off the water in many directions. The loop from Rippleside was about 57km. A very enjoyable ride. Thanks to everyone for a most enjoyable ride, and to John H for being a most supportive tail ender. This entry was posted in Joint rides with GTC, Ride reports, Uncategorized and tagged Cafe Blu Lara, Ted Wilson Trail by hlyth2013. Bookmark the permalink.